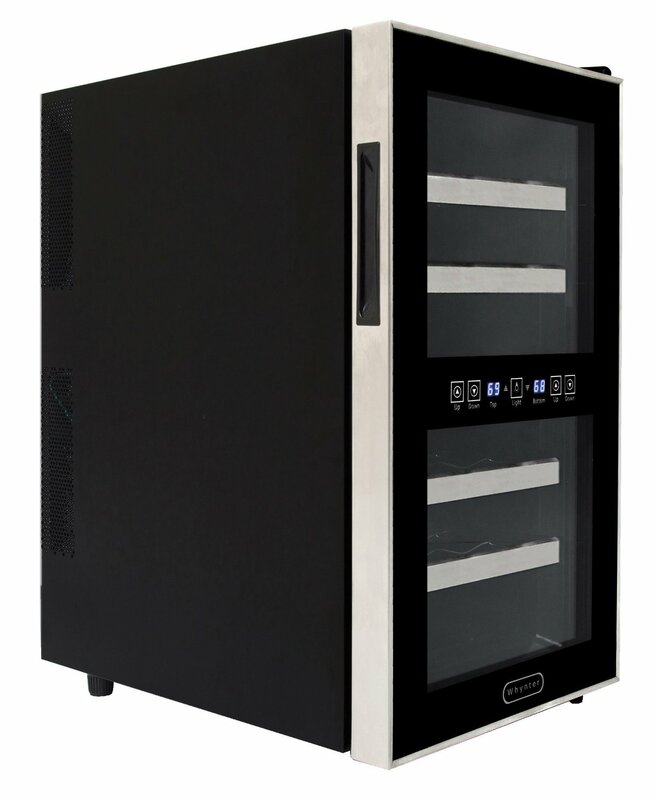 If you’re interested in picking up a dual zone wine cooler to simultaneously chill your whites and reds separately but aren’t sure which one gives you the best deal, then you’ve come to the right place. The convenience of a dual zone cooler can’t be beat if you love both white and red wines. If you’re storing your white wines in the fridge to chill before serving, you won’t have to do that anymore plus your whites will be at just the right temperature to enjoy with guests. Best of all, if you choose from the list below, you’ll be getting a great deal on your new cooler, so you can take satisfaction in knowing that you found the best one for the budget price range. Very nice! 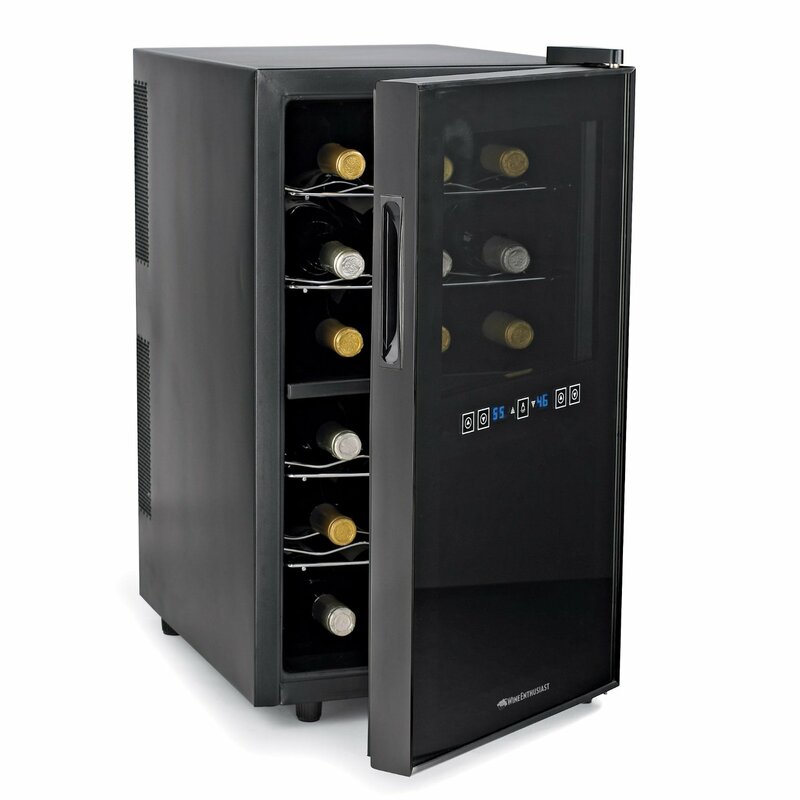 Most of these wine coolers are small to medium sized, as they are recommended for wine enthusiasts and connoisseurs who are just starting out, or would only like to keep a small collection at a time. If you plan on chilling a larger collection, you might consider investing in a 40 or 50 bottle wine chiller. But just for now, one of these should do the trick! Haier offers the best value of the bunch with this highly rated cooler. At about $130, it’s a steal for an efficient dual zone 12-bottle cooler. It looks fantastic. Its sleek, attractive design is an added bonus that you might not expect from a budget appliance. It runs quiet and keeps temperatures very accurately. The temperature of each compartment is controlled by its own LED display. Temperatures range from 46F (7.8c) – 66F (18.9c) in the upper compartment, and 54F (12.2c) – 66F (18.9c) in the lower compartment. A 18-bottle version of this model is also available for about $180. This 21-bottle cooler has wooden racks inside. It has two separate doors, one for each zone, with digital temperature adjustment at the top of each. At about $220, the price is quite low for a 21-bottle unit. The HomeImage cooler runs pretty quietly, and keeps temperature consistently. Temperatures range from 44F (7c) – 64F (18c) in the upper zone and 52 (11c) – 64F (18c) in the lower zone. HomeImage also makes an 18-Bottle model for about $180, and another, slightly lower quality 21-bottle model for about $200. 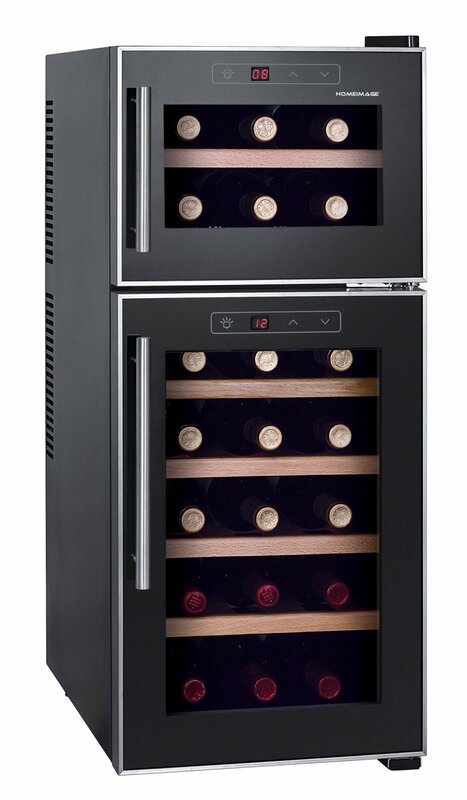 Wine Enthusiast offers a very nice dual zone wine cooler that includes a convenient touch screen for temperature control. As the name suggests, the cooler runs very quietly. You can barely hear it when it’s running. It looks like a mini refrigerator, and will blend in easily with the rest of your kitchen. At about $250, it’s not quite the cheapest on the market, but offers great value for its added features. Temperatures range from 54F (12.2c) – 66F (18.9c) in the top zone and 46 (7.8c) – 66F (18.9c) in the bottom. 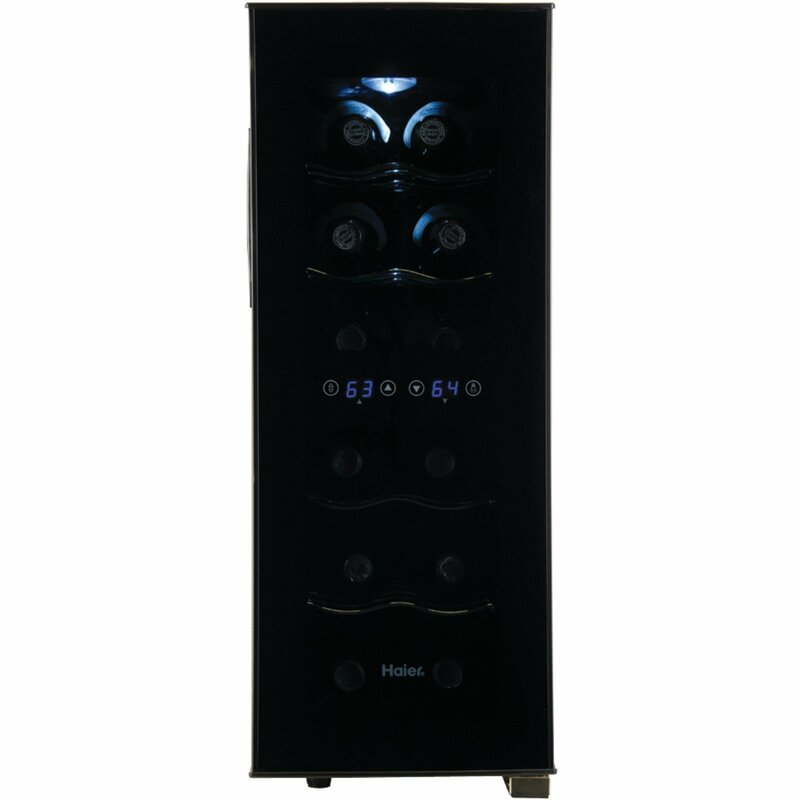 This 18-bottle cooler functions very well and keeps your wine at a constant temperature for about $160. It has four removable chrome racks inside. The interior fan runs continuously to circulate air within the cooler and maintain the temperate consistently. It’s very simple to set up and operate, and has soft LED lighting on the interior. The upper zone ranges from 45F (7.2c) – 54F (12.2c) and the lower zone from 54F (12.2c) – 64F (18c). 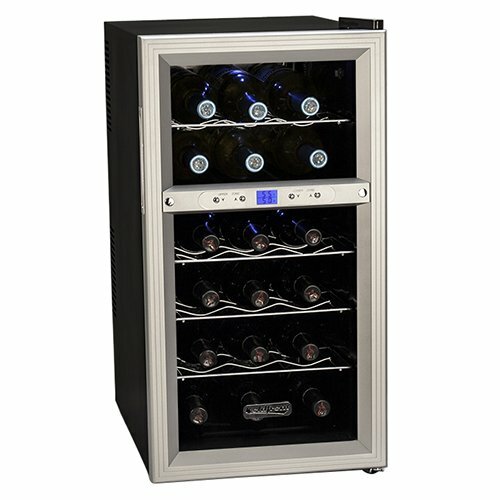 Whynter’s 18-bottle wine cooler has an attractive stainless steel trimmed design. The blue LED light that illuminates the interior acts as a nice night light in your kitchen. Each zone works well and keeps your wines at the desired temperature. The upper zone fits 9 bottles and ranges from 54F (12.2c) – 66F (18.9c) while the bottom also fits 9 and has a range of 46F (7.8c) – 66F (18.9c). The shelves are stainless steel and can be pulled out with a handle. For about $210, Whynter provides a nice looking cooler that will do the job well. There is also a 24 bottle version available for about $230.